We would like to wish everyone a prosperous 2012. After a long period of silence, the plan is to add more content to UKARANet this year. Thanks to Ken Tapping for submitting a report on his observations of the 2006 Perseids. See also his report on the 2004 Perseids. The radio station "Sunny 102.3 FM", located at Modesto, California (Latitude 37.66 N, Longitude 120.99 W), is too far from Penticton, British Columbia (Latitude 50 N, Longitude 120 W) to be received directly, however it is ideal for reception by scatter from the ionisation trails left by meteors. For some years now I have been running a radio meteor detector tuned to that frequency. 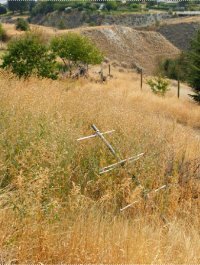 It is a relatively simple device, consisting of a 3-element Yagi antenna pointing up at an angle of about 45 degrees in an easterly direction. After 5 years of work with some ups and some downs, the 408MHz Survey project has been completed. This mixes some good with a lot of sad for team members. Sally Smith has sadly passed away. She was the daughter of John Smith who, with Ken Tapping, were the original builders of the 30ft telescope. After John's death, she expressed a wish to see the project done. Through health and illness over the last five years, she has done work on the system, collected data and kept things going at the telescope. It was always a pleasure to visit her and Joan (John's wife). Some happy with the sad is that Sally got to see the project finish. A paper on the project was written by Ken Tapping and is now available on the website. The project website can be found here. More project information will be added over time. The website will be maintained as a repository for project information. Currently, the telescope is being maintained in a working state for potentially one more project. Now it is Joan reporting on the telescope's status and it is still a pleasure to visit. Always a chance of getting some tea, conversation and if you stay too long you'll get food! 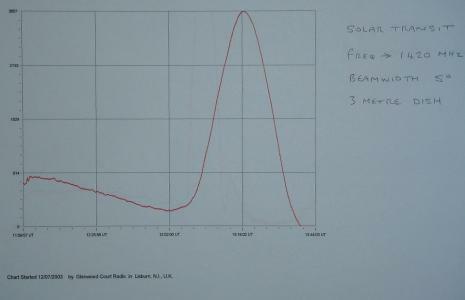 Ken Tapping has submitted his results from the 2004 Perseid meteor shower. Included in the article is a description of his system. Below is an abstract from the article. The article can be viewed and/or downloaded from here. 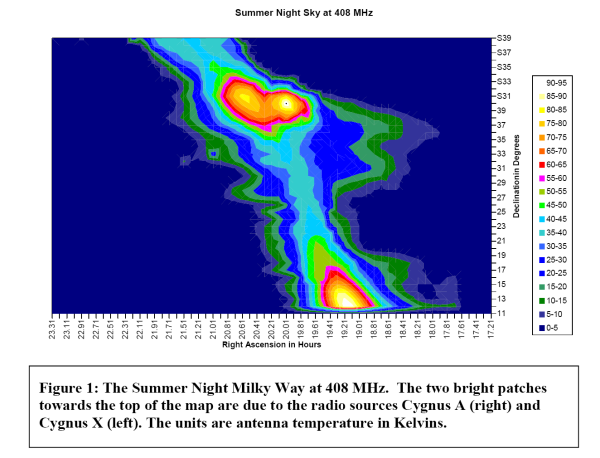 Radio Observations of Meteors: the 2004 Perseid Meteor Shower Etc. 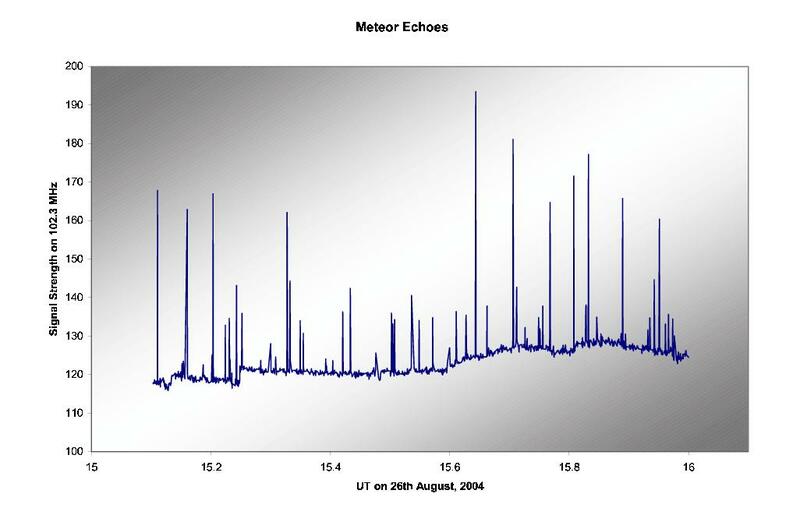 Figure 1: Each vertical spike in the figure is a radio echo from a meteor trail. These echoes, recorded in Penticton British Columbia, are of signals from one or more FM Broadcasting Stations on 102.3 MHz, observed on 26th August, 2004, between 1500 and 1600 UT, which is equivalent to 7:00-8:00 am Local Time (Pacific Standard Time). The record above shows bursts of radio signals reflected from the ionization in meteor trails. The signals come from some FM radio broadcasting stations transmitting at 102.3 MHz, which are too distant to be received by other means. This technique provides a very easy and useful way to count meteors, and has the tremendous advantages of being automatic, and of being unaffected by daylight or cloud. My introduction to radio observations of meteors was in the early 1970 s. It was during one of my many visits to Ron Ham, an amateur radio astronomer and general radio enthusiast living in Sussex. He had a radio tuned to the frequency of a VHF broadcast transmitter in Gdansk, in Poland, connected to a small Yagi antenna, pointed halfway up the sky, in an northeasterly direction. It was fascinating to listen to the bursts of music or speech, knowing them to come via the ionization trails left by meteors. In addition to detecting the usual meteor showers, he saw the normal diurnal variation in count rate, and also a slight drop in count rate when the Sun was very active. We attributed that to an increase in ionospheric (D-Region) absorption when the solar X-ray flux was higher. A couple of years ago, living at our current address in the Okanagan Valley, in British Columbia, I had an urge to try this for myself. This article describes the hardware, the experiment and discusses observations made of the 2004 Perseid meteor shower. The link to Andy Smith's radio reflection observatory can now be found here. It contains up to date information on meteors, sporadic-E and related ionisation phenomena. My Brother Karl Jansky and His Discovery of Radio Waves from Beyond the Earth by C. M. Jansky, Jr.
From an after-dinner address by C. M. Jansky, Jr., at the 94th meeting of the American Astronomical Society, Columbus, Ohio, March 23, 1956. This contains some interesting bits of personal information. A transcript of the address is hosted on the Bigear website, but is difficult to find from the Bigear frontpage. It can be found here. We have received a few VLF queries lately. Mr Peter King has graciously offered to take on the role of UKARANet VLF coordinator. Please contact him at vlf@ukaranet.org.uk with any VLF related queries. Results from VLF observations would be appreciated and will be published on UKARANet. Regular contributions would be useful. Peter runs his VLF setup continuously now. This was used this weekend to check for a potential solar outburst observed by another amateur radio astronomer. The ERAC website has a bunch of information, as usual. Papers are available from last year's ERAC Congress. There is also a presentation by Peter Wright on the ERAC ALLBIN interferometry project. It can be downloaded from the ERAC front page - it is 11MB in size, so will take a while to download. Already advertised is the 2006 ERAC Congress - more on that later. Plots of some observations done by Mr Colin Clements at his Glenwood Court Radio Observatory have been added in the UK Amateurs section.